A solid wood kitchen worktop will give you a life times pleasure as you watch the wood mellow and mature with time. Easy to maintain and stunning in appearance natural wood worktops lend themselves to traditional kitchens and allow for Belfast and under counter mounted sinks. Wooden countertops come in a variety of designs ranging from butcher block to joined planks to single wide stave. Wood is considered to be the most eco-friendly option when it comes to choosing a kitchen worktop as it is a renewable resource. Note: solid wood worktops must be oiled according the manufacturer’s instructions. Perfectly fitted by our craftsmen your solid wood worktop will last a life time, and as the wood slowly ages its natural beauty will shine through. And when, in years to come it need a face lift, badly worn or damaged surfaces can be sanded down, a coat of oil or varnish reapplied and your surface is once more a good as new. 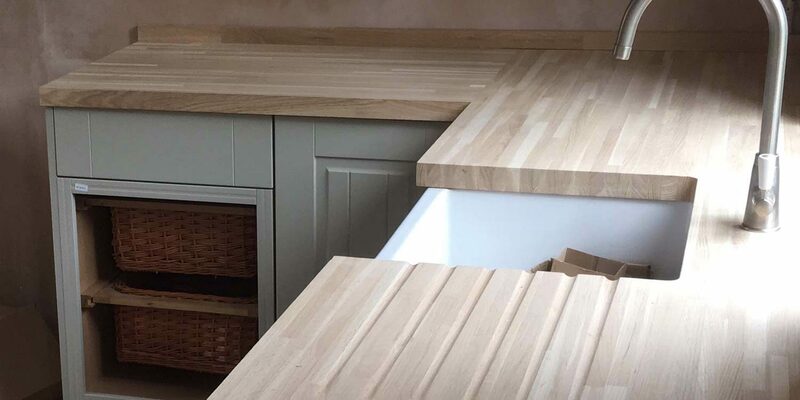 Midland Worktop Fitters will install your solid wood worktop with precision, drainage channels cut with accuracy and your hob rebated with care. Attention to detail is our watch-word and every job important to us. We want you to be happy with your new kitchen worktop and our installers always go the extra mile to ensure satisfaction. Solid wood worktops have the benefit of being solid all the way through however, as with other worktop surfaces, we strongly recommended the use of chopping boards to prolong its life as sharp blades can mark the surface and very hot pans placed straight on to the worktop can leave scorch marks. Another consideration when choosing a work surface is your choice of sink. Solid wood worktops are ideal for under mounted sinks or Belfast sinks which are not suitable for laminate worktops.